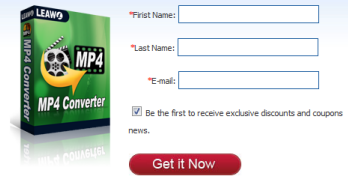 Need conversion software to convert your videos to MP4 format? Then grab a free Leawo MP4 Converter. 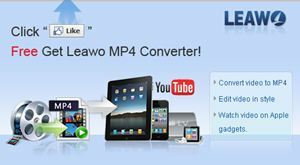 Leawo MP4 Converter is a powerful MP4 converter application that can easily convert video to MP4 formats for playback in portable media players like iPod, iPhone, Apple TV, PSP, PS3 and etc. Besides that, it also can be used to rip and convert video to MP3, WMA, AAC and etc. The converter program is also featured with some advanced functions like trim, crop, merge, batch conversion and custom output file that enable the conversion to be easier and handier. Convert video to iPod, iPhone and Apple TV MP4. Convert video to PSP and PS3 MP4. Visit Leawo facebook and click on the “Like” button to become the fans of Leawo, then enter the first name, last name and email address and click on “Get it Now” button. Use the received keycode and download link received via email to download and activate Leawo MP4 Converter.